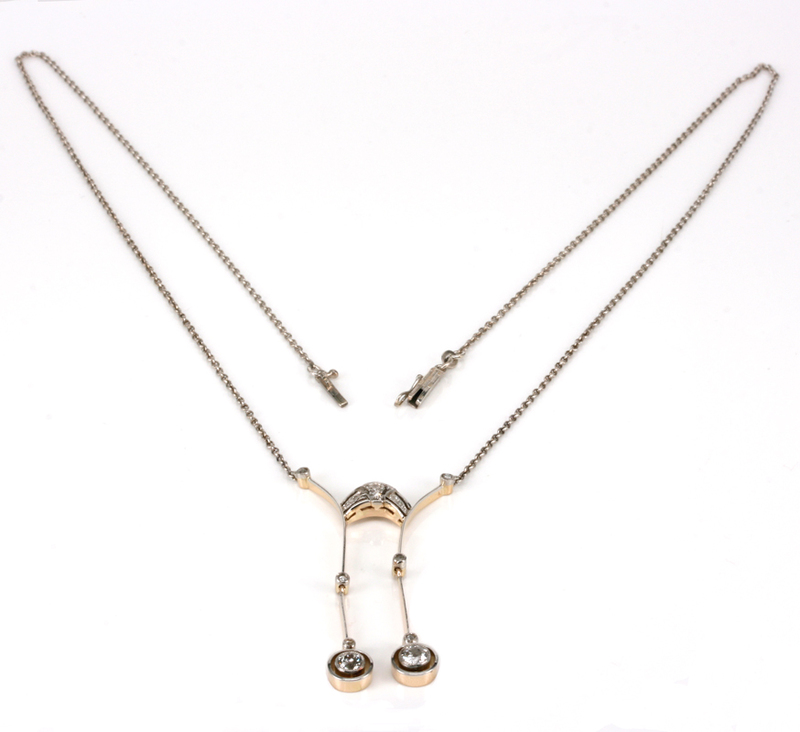 Product code: ES6284 Categories: Sold Items, Sold Jewellery. A negligee pendant is one where it has two drops of different lengths and was a popular form in the 1920’s to 1940’s Art Deco period, and here we have a very elegant Art Deco diamond negligee pendant in the Egyptian revival style. In 1922 when Tutankhamen’s tomb was discovered by Howard Carter in Egypt, the influence the styles had on jewellery was amazing resulting in what is called “Egyptian Revival” as can be seen here at the top of the pendant. Beautifully hand made in 18ct gold and platinum, the use of platinum was important as it allowed the jeweller who made this have the ability to do the very fine work and still be able to be strong enough to support the diamonds. Suspended at the bottom of each drop is a European cut diamond and these two diamonds total 0.28 carats. But it is not just about these two diamonds as leading up on each “stem” is a rose cut diamond and then there is that delightful Egyptian Revival section set with six more rose cut diamonds and two more European cut diamonds. And then leading to the chain a further rose cut diamond. These additional diamonds total 0.11 carats and from the lower drop to the top, this distance measures 42mm and looks delightful on the neckline. When laid out the platinum chain measures 45cm from end to end making it the perfect length to wear all the time and really stands out as one of the finest and elegant pieces of Art Deco jewellery. 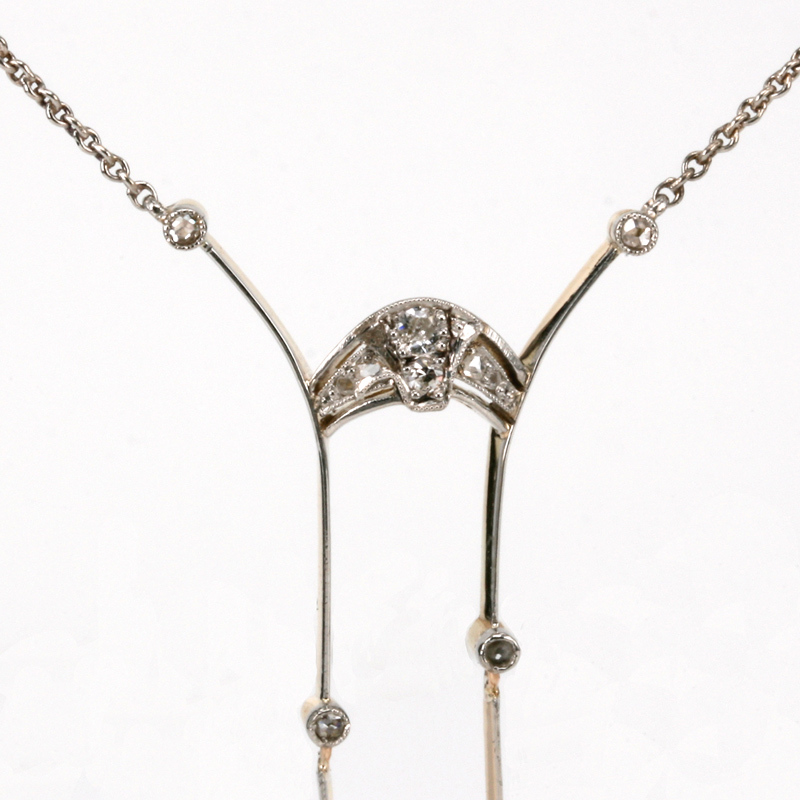 From the fabulous 1920’s Art Deco era, this diamond negligee pendant will always impress.